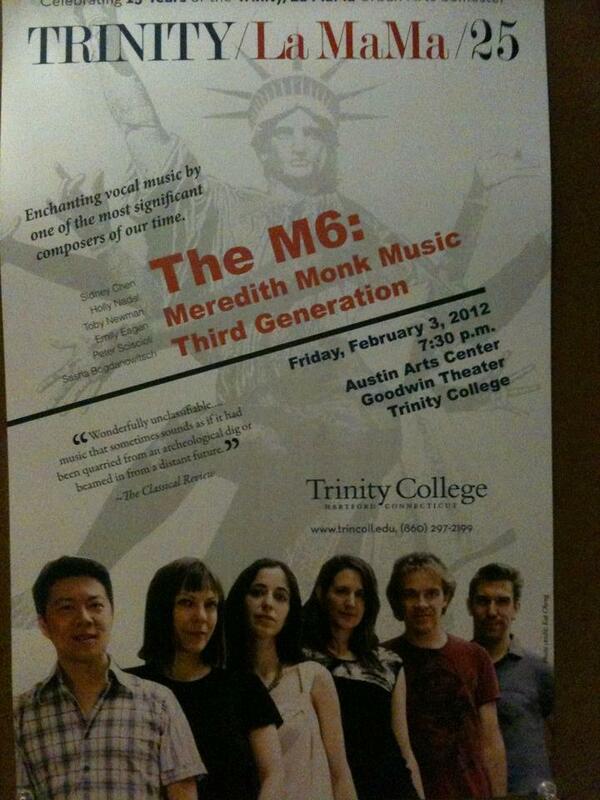 Excerpts from The M6: Meredith Monk Music Third Generation performance on February 3, 2012 at Trinity College in Hartford, CT. Video filmed and edited by Miceli Productions HD. Q2 Music celebrates America’s great iconoclastic composers when San Francisco Symphony music director Michael Tilson Thomas brings his “American Mavericks” tour to New York. In anticipation of their Carnegie Hall concerts, composer John Adams and Meredith Monk, the St. Lawrence String Quartet, pianist Jeremy Denk, and other guests joined Tilson Thomas for an evening of performance and conversation around the music of Charles Ives, John Adams and other maverick composers. WQXR’s David Garland and Q2 Music’s Nadia Sirota hosted. The women of The M6 will be performing a free noontime concert on Thursday, March 8 at Bronx Community College in the glorious rotunda of the Gould Memorial Library as part of Women’s History Month. We start our three-day residency at Trinity College in Hartford today, culminating with a concert on Friday night! Here’s a preview from the Hartford Courant. The M6, an ensemble that interprets the work of Meredith Monk, a composer-singer and director-choreographer, performs Friday, Feb. 3, 7:30 p.m. at the Austin Arts Center at Trinity College, 300 Summit St, Hartford. The concert features “Tablet” and 1976 composition for three female voices, two pianos and two soprano recorders, “Dolmen Music,” a 1979 work for six voices, cello and percussion, and selections from “Book of Days” from 1985, “Facing North from 1990 and “ATLAS” from 1991. 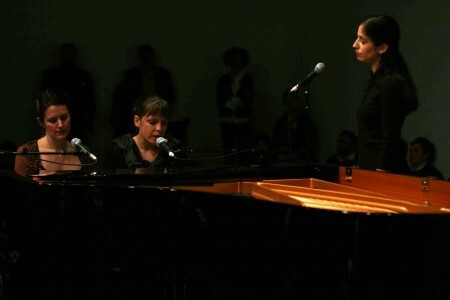 The ensemble is part of Meredith Monk’s most recent CD “Songs of Ascension” on EMI. Monk was named “composer of the year” for 2012 by Musical America, which began in 1898 as a weekly music newspaper. She has spent most of her career composing for her own ensemble, but has also received commissions from the Los Angeles Master Chorale, Kronos Quartet and from Michael Tilson Thomas for his New World Symphony in Miami. The six members of the M6 were trained in a professional workshop run by Monk in 2006. They are preserving Monk’s repertory and documenting them on video. The M6 group includes: Sasha Bogdanowitsch, Sidney Chen, Emily Eagen, Holly Nadal, Toby Newman, and Peter Sciscioli, with guest cellist Brian Snow. Sciscioli is an alumnus of Trinity/La MaMa (’95) and has been the voice teacher for the program since 2010. Tickets are $15, $10 for seniors and non-Trinity students and free for Trinity students. 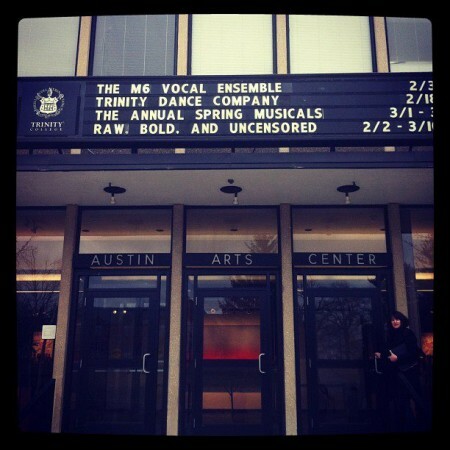 Information: 860-297-2199 and http://www.trincoll.edu. How great is it that WNYC’s John Schaefer picked Songs of Ascension, which we recorded with Meredith Monk & Vocal Ensemble, as the Top New Music Release of 2011? For this New Sounds, listen to John Schaefer’s completely personal and opinionated look at the ten best new music releases of 2011. There just might be music from folks working in Iceland, a producer/composer who makes soundscapes of plainchant laid over electronic sound grids, and something from an Irish composer. Plus, a collaborative record from a Malian kora player and a trip-hop cellist, one from a MacArthur “Genius” Award, an-winning composer, and still another from an Argentinian producer. We’re very excited to be premiering a new work of Meredith Monk’s called “Sheaving” (working title) Tuesday the 16th at Roulette (also a new venue for us). This will also be our most substantial concert to date, with selections from Meredith’s “Book of Days”, “Volcano Songs”, “Facing North”, along with “Three Heavens and Hells” and “Basket Rondo”. Come check it out – UPDATE: Time Out New York labeled it a Critic’s Pick! Roulette is a major New York City venue for contemporary music and intermedia art, internationally recognized for the presentation and promotion of experimental contemporary music, an incubator for young talent and a laboratory where new ideas and new technologies are examined, appraised and developed. 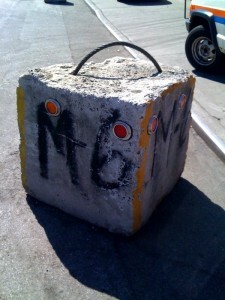 Attention Brooklynites: The M6 will be appearing at the Fabulous Jalopy Theatre in Carroll Gardens on Friday, July 30! We’re on a shared bill with the equally fabulous Moira Smiley and VOCO. You’ll get a rare double dose of M6er Emily Eagen, who will be performing with both groups. And who knows – maybe M6 and VOCO will find ourselves on the stage at the same time at some point? 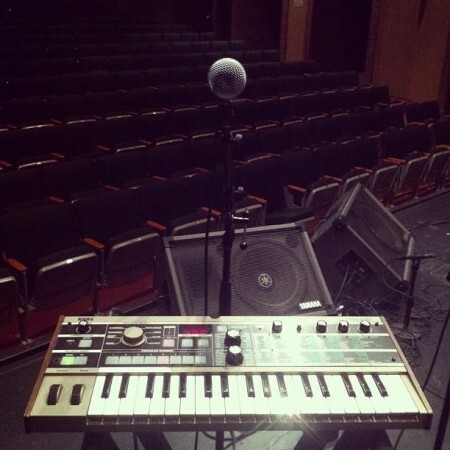 Come hear to find out what happens… We’re on at 9pm. By Subway: F or G train to Carroll St. (first car if coming from North/West). Walk 1 block up Smith St to 1st Place. Make left. Walk down past highway to Columbia St. Make left to 315 Columbia. 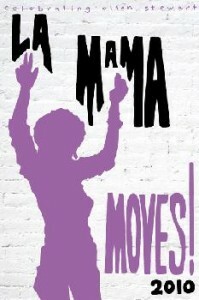 Put Your Hands in the Air for M6 @ La MaMa! 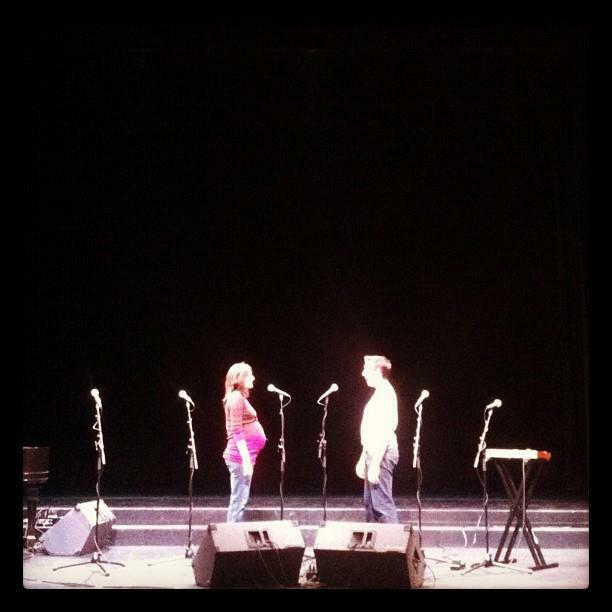 Thanks to everyone who turned out for our two shows at the La MaMa Moves! 2010 Dance Festival. We’re glad you were there for our first performances of a work-in-progress titled Basket Rondo, which was originally written for the Western Wind and is now being reworked for the M6. For those who missed it, check out our program below. R755 theme designed by varometro. 54 queries in 2.260 seconds.